Girl Scouts earn their Potter Badge at Cloud 9! 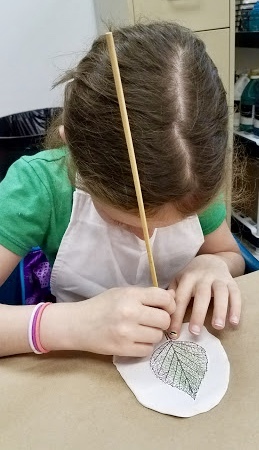 This weekend I had the pleasure of hosting Cloud 9 Art School’s first Girl Scout Potter workshops! We had two different Brownie troops visit and learn all about clay. After having a discussion about the history behind pottery, and handling some finished pieces, the girls got started on the fun part - getting messy! We did two different projects: a baked Sculpey leaf, and an air dry pinch pot. The Sculpey was molded and shaped using their hands, a rolling pin, a skewer as a cutting implement, and a leaf template. I encouraged them to get creative and design their leaves however they wished. Some of them opted to ruffle the edges or added veins like a realistic leaf, and some decided to go more abstract. They also had the option of poking a hole in their leaf, so as to use it later as a necklace or ornament. After they had created their leaves, we had extra Sculpey and time, so they got to stretch their clay molding skills and go wild! We had a lot of little food pieces and funny faces come out of their free choice time. Next, we used the air dry clay to create little pinch pots. I explained that making a pinch pot was a lot like using a potter’s wheel, only in slow motion. This is where they really got to exercise their fine motor skills - it takes a lot of strength to push and mold clay! Once again the results were all unique, with each girl creating their own design. Since we couldn’t paint these pots (they take several days to fully dry out) I provided beads so they could decorate them. After we cleaned up, the Sculpey leaves were baked and cooled and ready for paint! The girls got really creative, some painted realistically, some used their imagination. But all the girls had a good time exploring the color wheel and mixing their own hues. I sure had a great time teaching these kids some fun new art techniques and introducing them to clay as a medium. And they had a fun time too! I can’t wait to welcome more Girl Scouts to Cloud 9!